A blast as always. 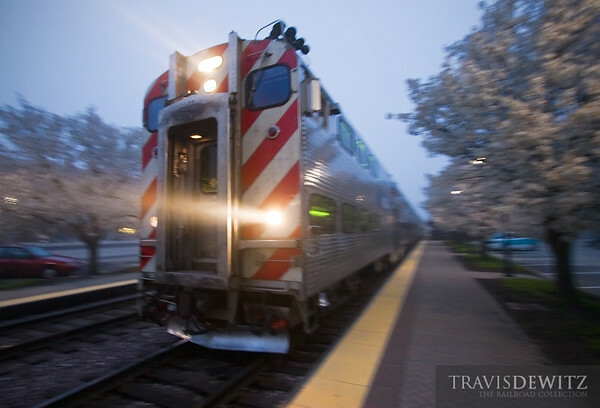 I was able to shoot ICE, WSOR, CTA, METRA, CP, and see UP all in a 5 mile area around Lake Forest. I was able to meet many old friends and see and meet many new. Nothing better then putting your digital friends into human form. The presentations were top notch along with the first train slide show. The real stories that went along with most of the presentations were just incredible and really gave life to the photos they presented. I have taken many tips, tricks, and ideas away from here as always. Walking around and talking face to face with well known artists like Benson, Jensen, Plowden, and others I seem to be forgetting is surreal. Talking to TRAINS and R&R maganzine staff, making frineds, and seeing what they want, like, or need can really give you a leg up if you want to get your work to print. This is what I did in the first day. With 7 foamin' idiots on the platform, I'd expect to see a few more shots of this train pop up in the DB. From left to right, that's Travis Dewitz, Jim Thias, me, AB(2), Steven Welch, CB(1) and John Ryan. Last edited by ottergoose; 04-28-2010 at 03:47 PM. Back lit. Cloudy day common photographer shots are generally not accepted. From left to right - Travis Dewitz, Jim Thias, Nick Benson, AB(2), Steven Welch, CB(1) and John Ryan. Last edited by travsirocz; 04-29-2010 at 02:01 PM. I was surprised by how tall the group of us was... I was middle of the pack, and I'm 6' tall. Last edited by travsirocz; 05-01-2010 at 03:39 AM. Harry Potter was the only short one. Rhymes with slice, rice and mice, and probably should be spelled like "Tice." And you were the only freezing one. I gots my floaties and I'm ready to go railroadin' in Minot. you lost the beard you had last summer when we met. I wouldn't have recognized you! I'm going to make a better effort to attend next year. When I heard Janusz wasn't going to be there.... Looking forward to meeting everyone.